Renal transplantation is the preferred therapy for children with end-stage renal disease. Along with its significant benefits, renal transplantation carries several risks, especially viral infection or reactivation secondary to immunosuppression therapy. Infections with cytomegalovirus (CMV), hepatitis C virus (HCV), and hepatitis B virus (HBV) are the most common.,,, All three infections are associated with hepatic dysfunction. In pediatric kidney transplant recipients, CMV infection is the most clinically important. An elevation in liver enzyme levels is an early clinical sign of CMV infection. However, it may also indicate toxicity of one or more of the immunosuppressive drugs administered to transplant recipients ,, or the presence of a primary liver abnormality, such as a celiopathy, which usually involves a biliary duct or hepatocellular abnormality. There are surprisingly few reports on the prevalence and implications of elevated liver enzyme levels after renal transplantation.,,, In children, the data are even sparser; the last such study was published in 1972. In the above studies, no data were provided on the level of bilirubin, gamma-glutamyl transferase (GGT), or the correlation with CMV infection or reactivation. The aim of the present study was to examine the prevalence, risk factors, and clinical importance of elevated liver enzyme levels in pediatric kidney transplant recipients. A retrospective longitudinal cohort design was used. The study group included all children who underwent renal transplantation and follow-up at a single tertiary pediatric medical center in 2001–2013, or who were referred to the same center following renal transplantation elsewhere during the same period. Patients were identified through a search of the hospital's database. Exclusion criteria were combined kidney and liver transplantation and missing data for more than 1 week in the posttransplantation period. The study was approved by the Institutional Review Board. Induction was based on three doses of thymoglobulin (1–2 mg/kg) from 2001 to 2006, two doses of daclizumab (1 mg/kg on days 0 and 14), and two doses of basiliximab (10–20 mg) from 2007 to 2012. Prednisone was administered at 10 mg/kg/day on the transplant day and then tapered as follows: 5 mg/kg on postoperative day 2, 2.5 mg/kg on day 3, 40 mg/m 2 on days 4–7, 30 mg/m 2 on days 7–14, 20 mg/m 2 on days 14–30, and 7.5 mg/m 2 on days 43–90. Maintenance was based on triple therapy with a tacrolimus level of 3–5 ng/ml, mycophenolate mofetil dose of 300 mg/m 2/dose, and prednisone at 5 mg/m 2/day for 3–6 months, and then tapered to 5 mg/m 2 every other day. The following data were collected from the patient files: primary renal disease; liver function in the week before transplantation; source of transplant (deceased donor, living-related donor, and living nonrelated donor); liver function; level of tacrolimus postoperatively (days 1, 3, 7, 14, 30, 90, 180, and 365); and CMV, HBV, HCV, and hepatitis A virus serology before transplantation and 6 and 12 months after. A review of the liver sonograms was made after transplantation. Estimated glomerular filtration rate (eGFR) was calculated using the Schwartz equation 1 year after transplantation. We also noted the use of any medication (other than those included in transplant protocol) with a possible influence on liver function (insulin, statins, fluconazole, phenytoin, amlodipine, and fluoxetine). Alanine aminotransferase (ALT), aspartate aminotransferase (AST), GGT, and bilirubin were measured with an automated machine (Olympus AU 680/640, Beckman Coulter), according to the manufacturer's instructions. Abnormal levels were defined as ALT > 45 U/L, GGT > 55 U/L, or bilirubin >1 mg/dl. We excluded AST from the final statistical analysis because it may have been elevated as a result of other factors, such as hemolytic specimen. Statistical analyses were performed using Sigma STSTE software 3.2 (Systat software Inc., San Jose, California, USA). Groups were compared for clinical variables by one-way analysis of variance. Of the 71 patients who underwent renal transplantation at our medical center or were referred after renal transplantation elsewhere during the study, 9 were excluded from the study, 3 received a combined kidney–liver transplant, and data were missing for 6 patients. The remaining 62 patients formed the study cohort, including 4 patients who were operated on abroad and subsequently followed by us starting 3–5 days after transplantation. Mean age of the cohort at kidney transplantation was 10.2 ± 4.8 years; 43 (67%) were males and 21 (33%) were females. The most common renal disease was dysplastic-hypoplastic kidney (33 patients, 53%) followed by nephronophthisis (10 patients, 16%). Congenital nephrotic syndrome accounted for 8% of cases and focal segmental glomerulonephritis (FSGS) for only 6.5%. Ten patients (16%) had other renal diseases. Thirty-two kidneys (50%) were from living donors and the rest from deceased donors. Forty-nine patients (80%) were treated with dialysis before renal transplantation: 23 (37%) peritoneal dialysis, 19 (31%) hemodialysis, and 7 (11%) both; 13 patients (21%) underwent preemptive transplantation. Seven patients (11.3%) had abnormally elevated liver enzyme levels in the week before transplantation. The cause was known in three of them: neonatal history of ischemic liver injury, primary sarcoidosis with multiorgan involvement, and pancreatitis diagnosed 4 months before kidney transplantation. During the 6-month period after transplantation, 42 patients (67.7%) had abnormally high levels of ALT (20 patients), GGT (1 patient), or both (21 patients). ALT levels 14 days posttransplantation [peak incidence, [Figure 1] ranged between 48–693 U/L with a mean of 157.6 U/L and median of 84.5 U/L. There were no cases of abnormal bilirubin levels (data not shown). To determine the likelihood of the development of abnormal liver enzyme levels after kidney transplantation, the findings were analyzed using three parameters: liver function before transplantation, CMV seroconversion, and type of the kidney disease. in the rest of the cohort (64%), but the differences were not significant. Five of the nine patients were positive for the CMV polymerase chain reaction (PCR) or antigenemia test, and four were negative. Meantime for seroconversion was 5.5 months' posttransplantation. Eight of the patients were pretransplant CMV IgG negative. There was no correlation between preemptive transplantation and modality of dialysis with the development of elevated liver enzyme levels. [Table 1] shows that elevated liver enzymes were found in 80% of the patients with dysplastic-hypoplastic kidney or nephronophthisis compared to 50%–60% of patients with other diseases (60% of patients with congenital nephrotic syndrome and 50% of patients with FSGS). The differences were not statistically significant, but the trend was consistent. Analysis of the incidence of abnormal liver enzyme levels at different time points, from the week before renal transplant to 6 months' posttransplantation yielded two important observations [Figure 1]. First, the rate of elevated enzyme levels at 3–6 months after transplantation was similar to the likelihood of obtaining an abnormal result on random blood testing of children on dialysis with chronic renal failure (10% for both). Second, in the 1st month after transplantation, there was a significant rise in the incidence of abnormal liver enzyme levels, with a peak at 14 days (47%). This result was statistically significant (P< 0.05). 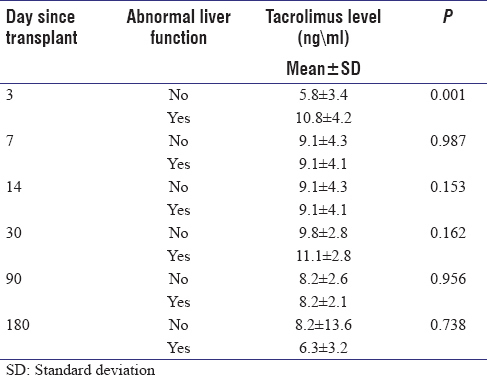 The correlation between tacrolimus level and acute liver injury [Table 2] was statistically significant (P = 0.001) and positive, but only on day 3 after transplantation. There was no correlation between the use of other medications that were not included in transplant protocol and elevated liver enzymes. Liver ultrasound was performed at the end of the 1st year after transplantation in 54 patients. The scan was abnormal in two patients, who also had abnormal findings before transplantation. Liver ultrasound had no yield in terms of liver enzyme levels. There was no correlation between eGFR 1 year after transplantation and elevated liver enzymes. In our daily clinical work, many of our patients developed mildly elevated liver enzyme levels during the 1st month after renal transplantation. However, there are limited data regarding its clinical meaning or the optimal diagnosis workup. In our study, we collected data on the prevalence of abnormal liver enzyme levels and tried to determine if the cause was drug related or viral induced in this study. The present study shows that a transient abnormally high liver enzyme level is a common finding in the 1st month after renal transplantation in children, with a peak at 14 days. Our observations agree with the few previous studies on the association between renal transplantation and elevations in liver enzyme levels.,, However, this is the first such study performed in the current era of tacrolimus instead of cyclosporine immunosuppression; and the second study, after almost 40 years, that focuses on children. None of these studies look at correlations with CMV infection. In the present study, liver enzyme levels increased in 67% of the pediatric renal transplant recipients during the 1st year after transplantation. Immunosuppression was based on thymoglobulin/daclizumab, tacrolimus, mycophenolate mofetil, and prednisone. All affected patients had a mild self-limited liver injury. None had abnormal bilirubin or albumin levels, and in the few patients who underwent a coagulation test, the results were in the normal range (data not shown). In a recent study of adults who underwent renal transplantation and were treated with cyclosporine and mycophenolate mofetil/azathioprine during 2008–2010, Einollahi et al. reported a 50% rate of elevated enzyme levels. The timing of the rise was similar to that found in our study, and the patients had similar hepatocellular pathologies. By contrast, in the much-earlier study in children (1967–1971), the rate of abnormal liver enzyme elevations was only 14%. Most of the patients had a cholestatic injury and were treated with azathioprine and prednisone. We assume the difference in the rate of liver enzyme elevation and the liver injury was at least partly attributable to the differences in the medication regimen. Both mycophenolate mofetil  and tacrolimus (a calcineurin inhibitor) have been associated with liver injury. In our study, on the 3rd day after transplantation, we found a correlation between abnormally high liver enzyme levels and tacrolimus levels. A similar association was reported by Einollahi et al. for cyclosporine. This finding may be explained by the lower drug metabolism during mild liver injury. The exact mechanism of calcineurin liver injury is currently unknown. Analysis of our results yielded three additional factors with a potential role in posttransplant liver enzyme elevations: (1) CMV seroconversion, (2) pretransplant liver enzyme status, and (3) type of renal disease. A clear trend, weakly significant, was found for each of these factors. The results may be attributed to the small sample size. Our center uses a 6-month prophylaxis protocol in all pediatric transplant recipients. All children in the study underwent CMV IgG testing before transplantation and 1 year after. Seroconversion occurred in nine children, of whom eight had elevated liver enzyme levels during the 1st year. Most had a positive CMV PCR or antigenemia test. We suspect that the sole patient with normal liver enzyme levels had an asymptomatic infection. These results support our clinical suspicion that an abnormal liver enzyme test in patients on immunosuppression can be secondary to CMV reactivation or infection. CMV seroconversion was found in one out of five of patients with ELE. This is a high rate compared to 7%–8% of CMV seroconversion during the 1st year in other studies. This is absolute high rate requires a CMV PCR test in all children with ELE, especially when they pretransplant CMV IgG negative. 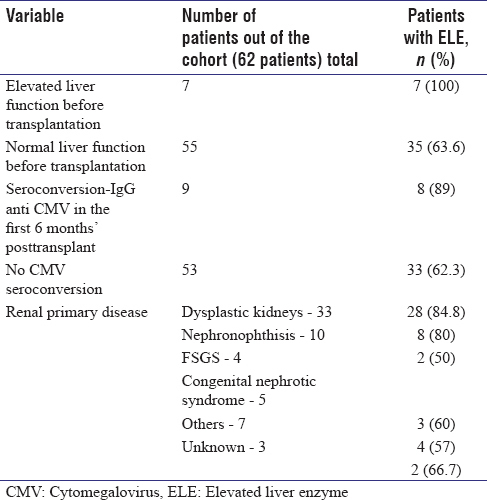 We also found that all patients who had high liver enzyme levels before transplantation had at least one abnormal liver enzyme test after, making this association even stronger than that for CMV IgG seroconversion (100% vs. approximately 90%). In addition, the rate of abnormally elevated liver enzyme levels was considerably higher in children with nephronophthisis (80%) compared to children with FSGS or congenital nephrotic syndrome (50%–60%). This finding was expected given that patients with nephronophthisis have hepatic fibrosis. Surprisingly, however, 84% of the patients with hypoplastic-dysplastic kidney also had an abnormal liver test. Revision of our analysis and a search of the literature failed to yield an explanation for this association. We chose to use a longitudinal retrospective design because it is ideal for collecting descriptive data and made it possible for us to compare our findings with previous-related studies, all of which used a similar methodology. However, it precluded the differentiation of viral infection from other etiologies and prevented conclusions regarding pathophysiology or cause and effect. Other study limitations were the small sample size, the absence of a standard departmental protocol for the evaluation of patients with abnormal liver enzyme levels, and lack of data on mycophenolate mofetil levels. Liver enzyme level is lower in an adult patient on hemodialysis; there are no studies on children on dialysis. As we show about 10% of our dialysis, patients had abnormal liver test similar to the rate of children 6 months' posttransplant. It is possible that using normal reference range values there is underestimation, but since our study is focused on liver enzyme level post-kidney transplant, this point is irrelevant. Transient high liver enzyme levels are a common finding in pediatric kidney transplant recipients, usually within 1 month of transplantation. The cause is probably multifactorial; drug hepatotoxicity, previous liver injury, and acute viral infection or reactivations are likely possibilities. Clinical and laboratory investigations for viral infection or reactivation should be done in all patients with elevated liver enzyme levels in this setting. Fine RN. Renal transplantation for children – The only realistic choice. Kidney Int Suppl 1985;17:S15-7. Agarwal SK. Hepatitis B infection during renal replacement therapy. Hepat Mon 2010;10:255-7. Nath A, Agarwal R, Malhotra P, Varma S. Prevalence of hepatitis B virus infection in non-Hodgkin lymphoma: A systematic review and meta-analysis. Intern Med J 2010;40:633-41. Bao YP, Du C, Lu HY, Lian Z, Qiu Y, Mu Y, et al. The investigation of HIV and HCV infection and risk factors among opiate drug users in Beijing, China. Am J Drug Alcohol Abuse 2012;38:140-5. Du LY, Tang H. Treatment of HCV patients before and after renal transplantation. Hepat Mon 2011;11:880-6. Kowalsky S, Arnon R, Posada R. Prevention of cytomegalovirus following solid organ transplantation: A literature review. Pediatr Transplant 2013;17:499-509. Mesar I, Kes P, Hudolin T, Basic-Jukic N. Rescue therapy with sirolimus in a renal transplant recipient with tacrolimus-induced hepatotoxicity. Ren Fail 2013;35:1434-5. Balal M, Demir E, Paydas S, Sertdemir Y, Erken U. Uncommon side effect of MMF in renal transplant recipients. Ren Fail 2005;27:591-4. Waters AM, Beales PL. Ciliopathies: An expanding disease spectrum. Pediatr Nephrol 2011;26:1039-56. Einollahi B, Ghadian A, Ghamar-Chehreh E, Alavian SM. 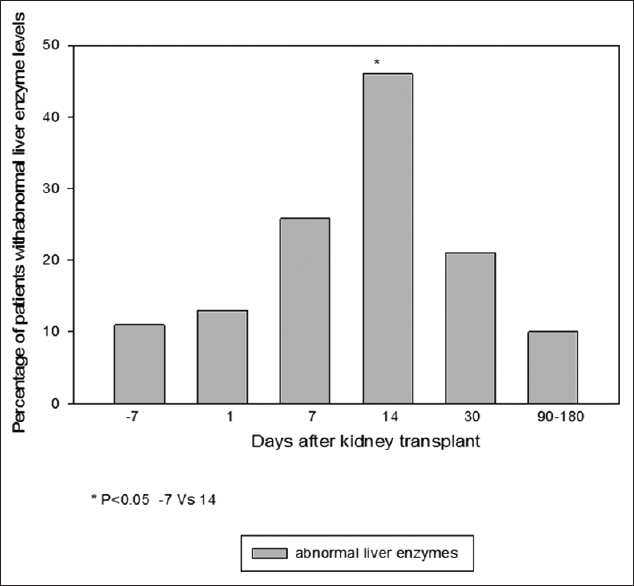 Non-viral related liver enzymes elevation after kidney transplantation. Hepat Mon 2014;14:e9036. De Santo NG, Fine RN, Carella C, Leumann E, Amato G, Fine S, et al. Thyroid function in uremic children. Kidney Int Suppl 1985;17:S166-9. Malekzadeh MH, Grushkin CM, Wright HT Jr., Fine RN. Hepatic dysfunction after renal transplantation in children. J Pediatr 1972;81:279-85. Lorber MI, Van Buren CT, Flechner SM, Williams C, Kahan BD. Hepatobiliary complications of cyclosporine therapy following renal transplantation. Transplant Proc 1987;19:1808-10. Schwartz GJ, Muñoz A, Schneider MF, Mak RH, Kaskel F, Warady BA, et al. New equations to estimate GFR in children with CKD. J Am Soc Nephrol 2009;20:629-37. Fung JJ, Alessiani M, Abu-Elmagd K, Todo S, Shapiro R, Tzakis A, et al. Adverse effects associated with the use of FK 506. Transplant Proc 1991;23:3105-8. Yasuda K, Okuda K, Endo N, Ishiwatari Y, Ikeda R, Hayashi H, et al. Hypoaminotransferasemia in patients undergoing long-term hemodialysis: Clinical and biochemical appraisal. Gastroenterology 1995;109:1295-300.